Situated in downtown Hurghada,Desert Rose Resort is a luxury 5-star resort that offers excellent facilities, well-furnished rooms and all-round entertainment to its guests. 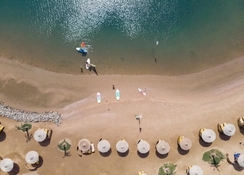 With its own strip of private beach along the Red Sea, an aqua park for the guests to soak in, and several restaurants serving delicious local cuisine, Desert Rose Resort promises to offer its guests an unmatched experience of luxury. A nightclub that grooves to latest mix from a resident DJ, an amphitheater bustling with world class animation shows are its other attractions. Set amidst lush landscaped garden and offering spectacular views, this is indeed the resort with a difference for your dream Red Sea Vacation. Desert Rose Resort is strategically located in downtown Hurghada with all attractions like cafes, bars and restaurants at walkable distance. It is also very close to Senzomall, a popular shopping destination. The Hurghada International Airport is 15 minutes’ drive away, and the hotel provides a limo service to and from the airport. The resort has of 872 spacious guestrooms and 40 suites offering excellent views of the landscaped garden, the lagoon and the seaside. The rooms have air-conditioning, balcony with sit out, telephone, satellite TV, mini refrigerator, safe deposit box, hair dryer and luggage rack. 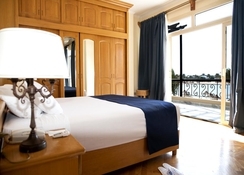 In addition, guests can ask for extra services like babysitting, cribs, laundry/dry clean, ice machines and so on. Toiletries and a hairdryer are stocked in all bathrooms. The Desert Rose Resort has five restaurants offering a selection of varied and delicious cuisines from various regions of the world. The main restaurant serves all major meals and brunch in buffet style. It also organizes theme dinners very night. However, there are several a la restaurants to cater to your taste buds. La Dolce Vita is an Italian restaurant, while Al Fattoosh specializes in Lebanese cuisine. IL Delfino is a seafood restaurant located on the beach. 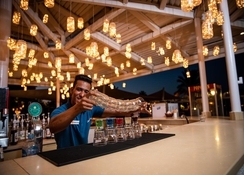 As many as nine bars including Tropicana Pool Bar, Bella Vista and Ali Baba serve oriental drinks and shisha. The hotel has an Olympic swimming pool and an aqua park where kids and adults can have fun. The pool is served by poolside bars that serve drinks and light snacks. There is sun terrace for sun bathing and if you’re into fitness, head to the gym. 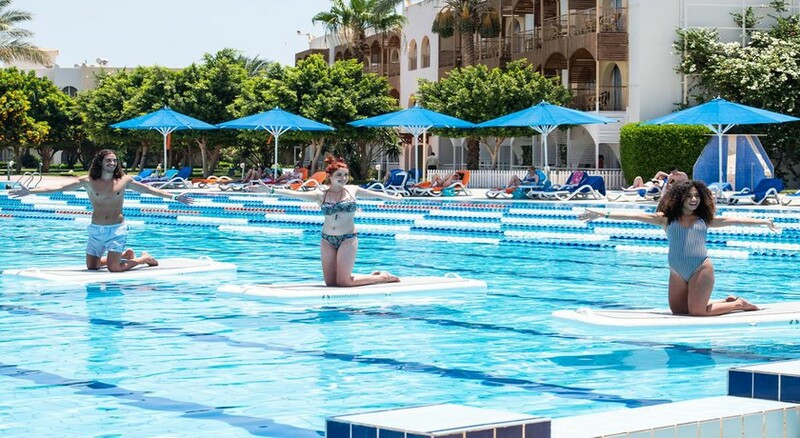 There are facilities for tennis, table tennis, billiards and for the adventure minded, the nearby bech offers exciting avenues for snorkeling, canoeing, windsurfing and diving. Loved this resort, got to be one of the best in Hurghada with its own beautiful bay, bright flowers everywhere and large swimming pools. Only problem was it got quite busy to the end of our stay, it may have been an Egyptian holiday as there were lots of families. Struggled to get a spot by the pool a few times so decamped to the beach which was fantastic, if you walk a bit further along from the resort you can find yourself a nice quiet spot. Water is crystal clear so great for a little snorkelling although there were many dead (but harmless) jellyfish floating around. Garden facing room wasn’t the best not much of a view so probably worth upgrading. Resort itself is massive with a great choice of restaurants (Italian, Mexican etc...) which you can try for free. All inclusive has lots of options too. No problem as a vegetarian just be a bit careful as not all food is clearly labelled. If you can’t find something to eat here you must be a picky eater!! Such a great experience would love to go back one day.